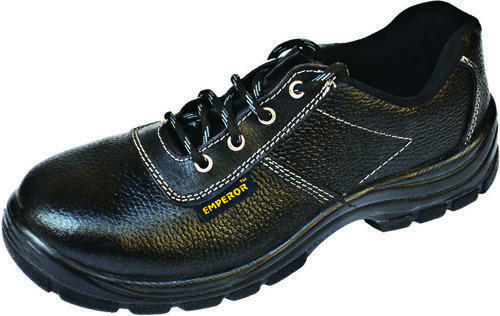 Owing to our amiable relationship with reliable vendors, we are able to wholesale and trading an excellent range of Emperor Safety Shoes. Manufactured using quality raw material and advanced technology, our offered range is developed by a team of skilled and efficient professionals at our vendors’ end. Bestowed with features like comfortable fitting, smooth finish, light weight and high durability, our offered range is widely reckoned by in the market. Best suited in mining industries. Founded in the year 2010 we, Sai Enterprises is a foremost business name occupied the business of Wholesaler, Manufacturer Retailer and Trader a comprehensive collection of products such as Safety Gloves, Safety Google, Safety Mask , Hearing Protection, Safety Helmet, Safety Shoes and Cotton Waste. In addition to this, our capability to handle with bulk orders, altered provisions and rock bottom rates of our customers makes us hugely popular. With our huge circulation network, we are able delivery these products to each and every corner of the nation.